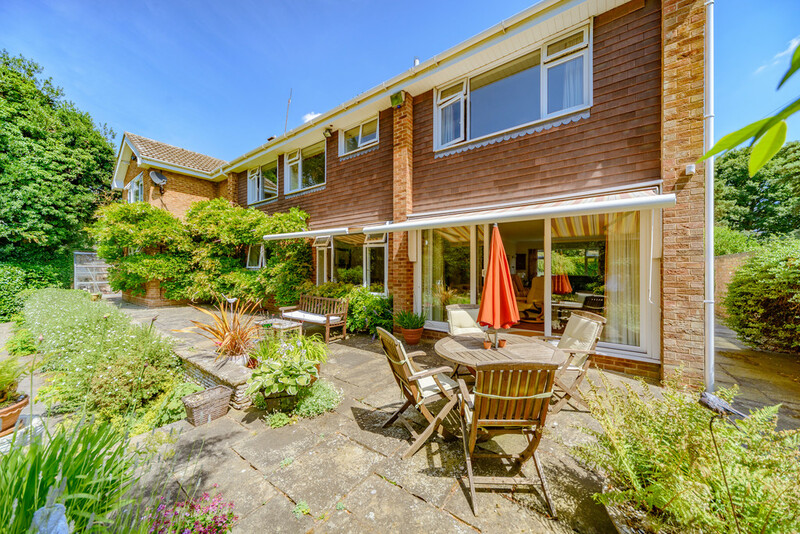 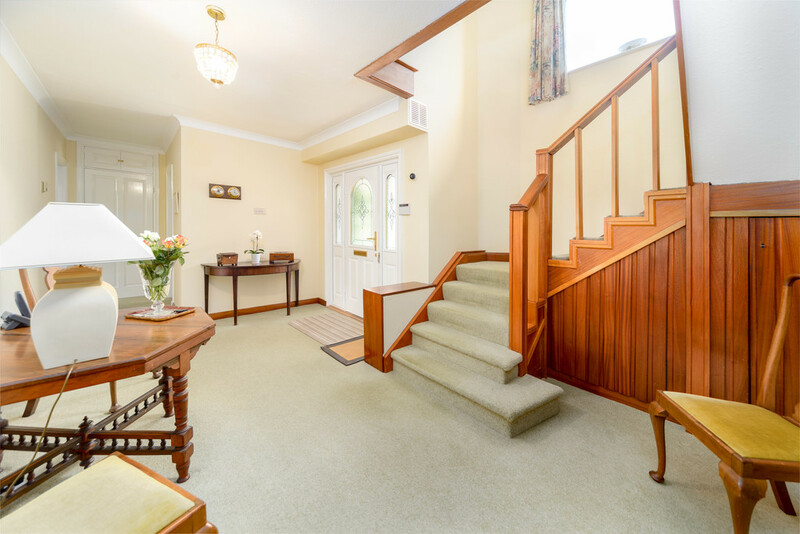 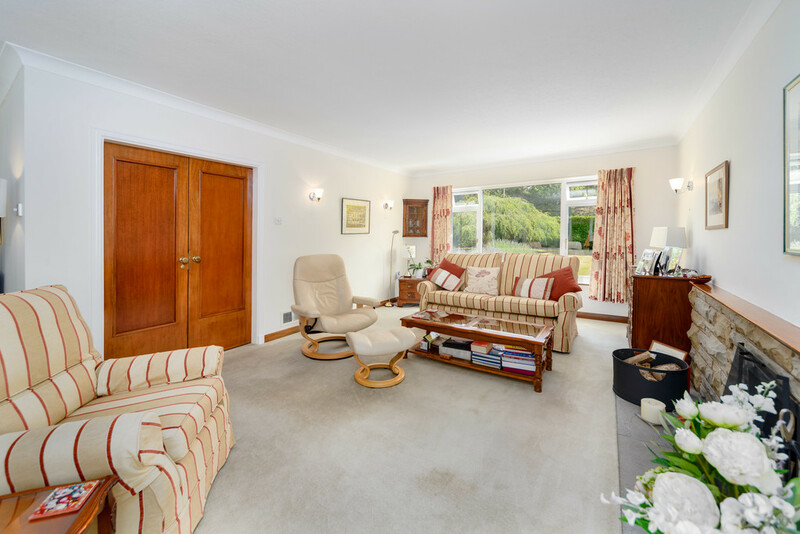 THE PROPERTY Rokewood is a substantial detached family house originally built in 1960 and subsequently extended at first floor level providing a separate large one bedroom, one reception room self-contained apartment. 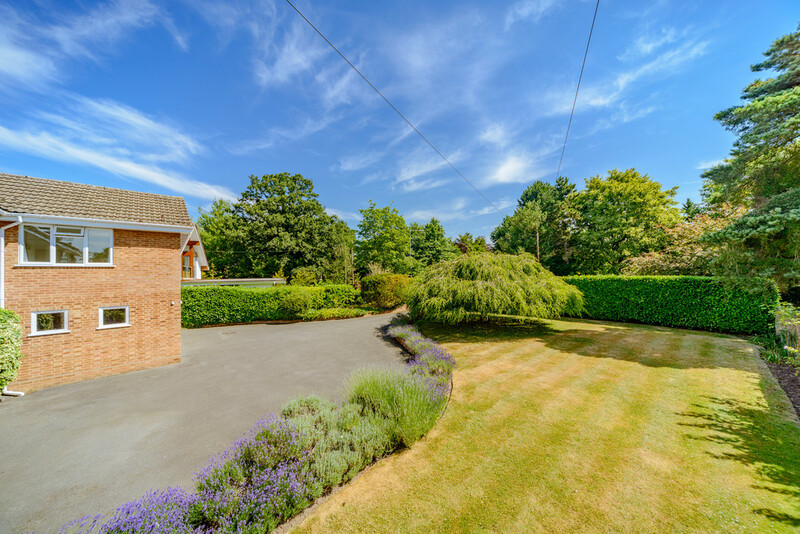 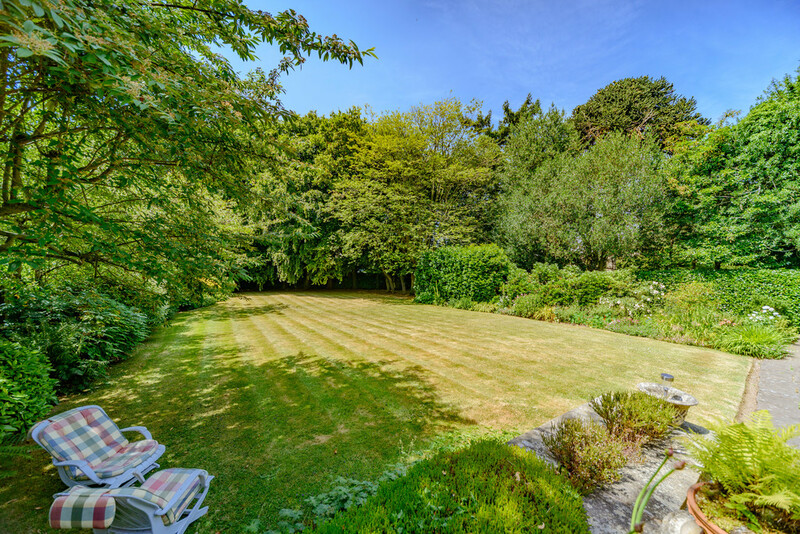 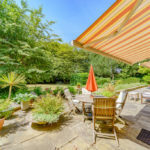 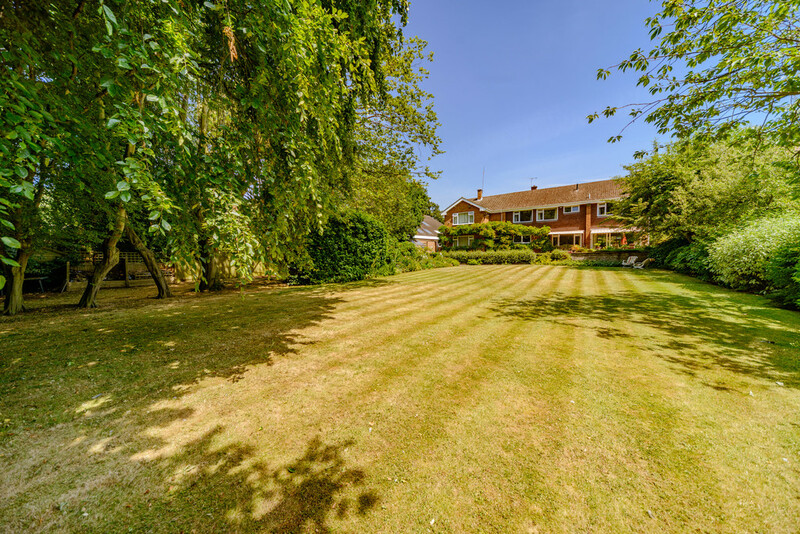 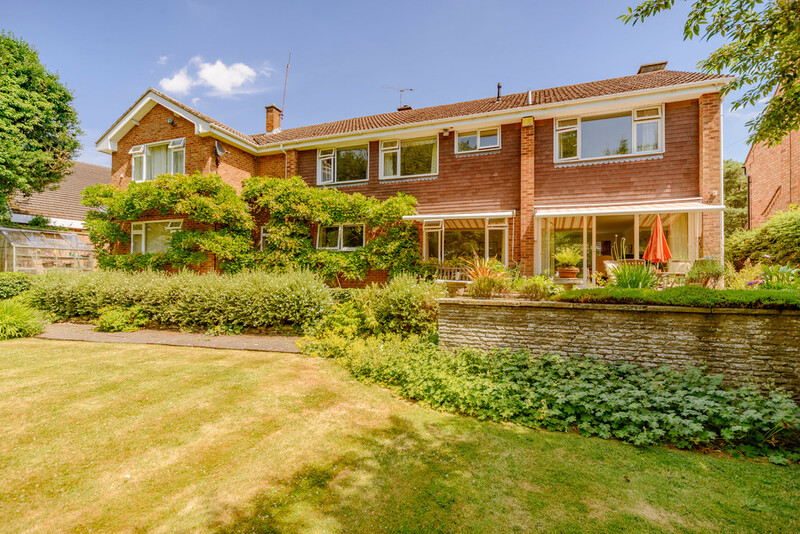 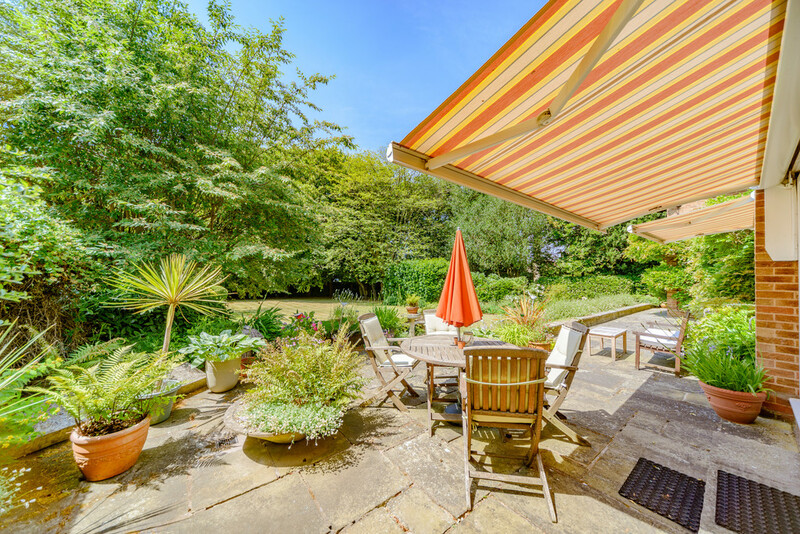 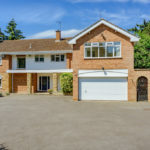 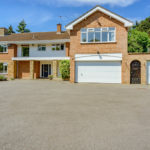 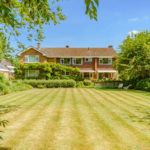 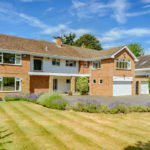 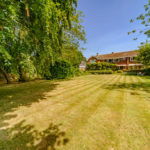 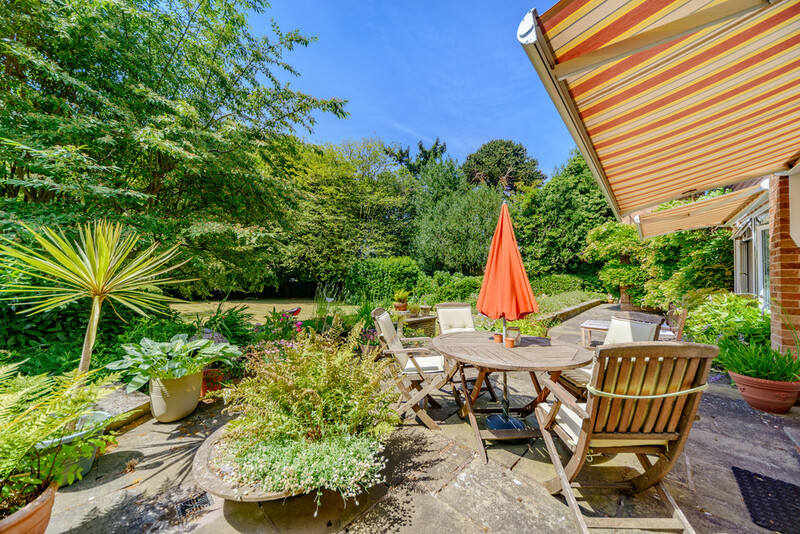 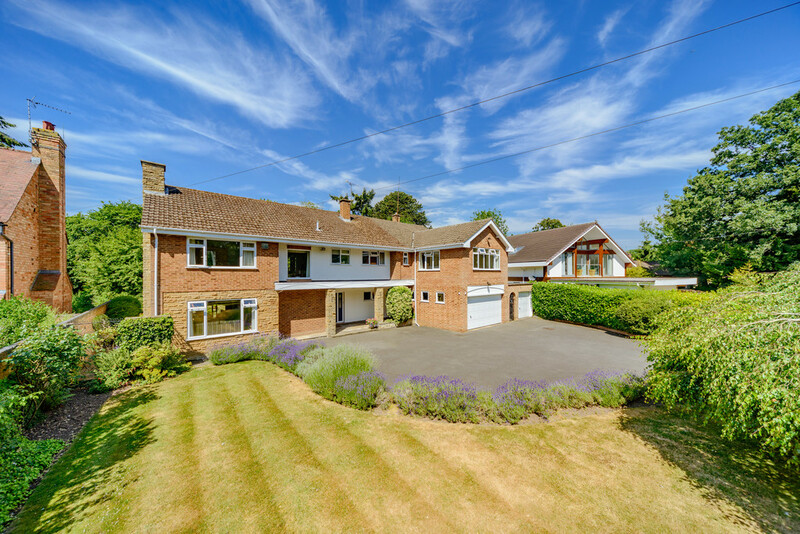 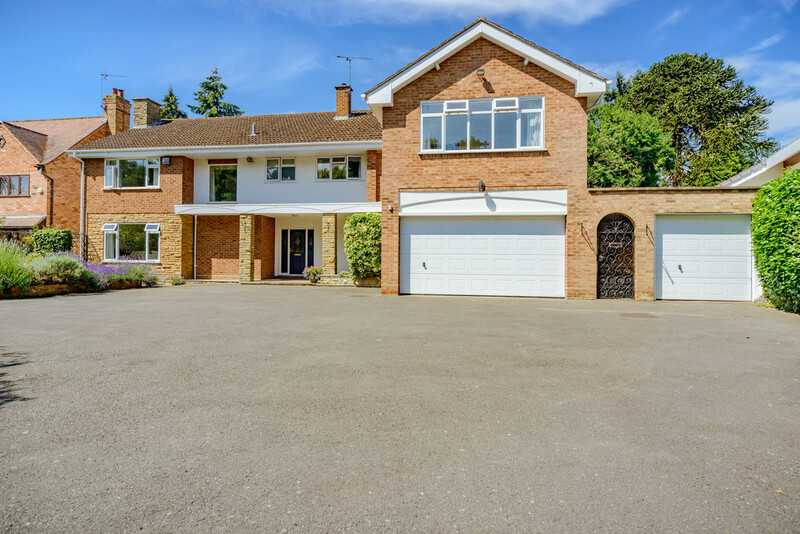 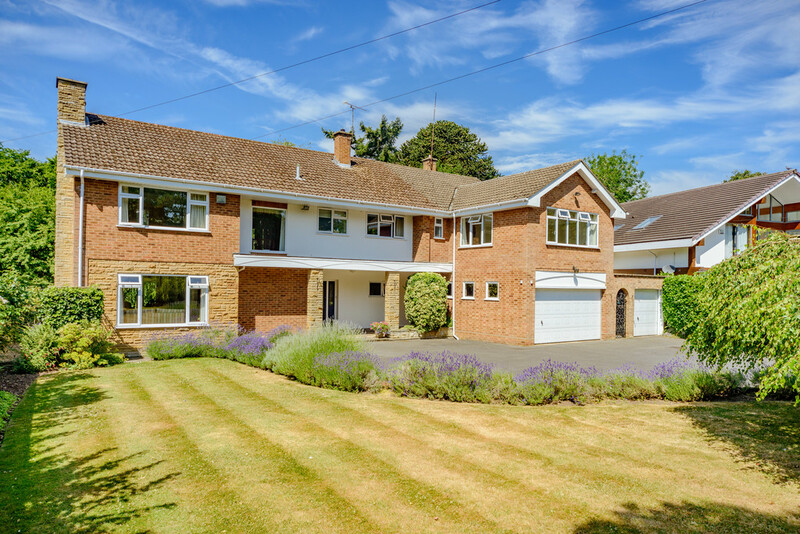 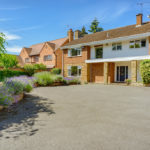 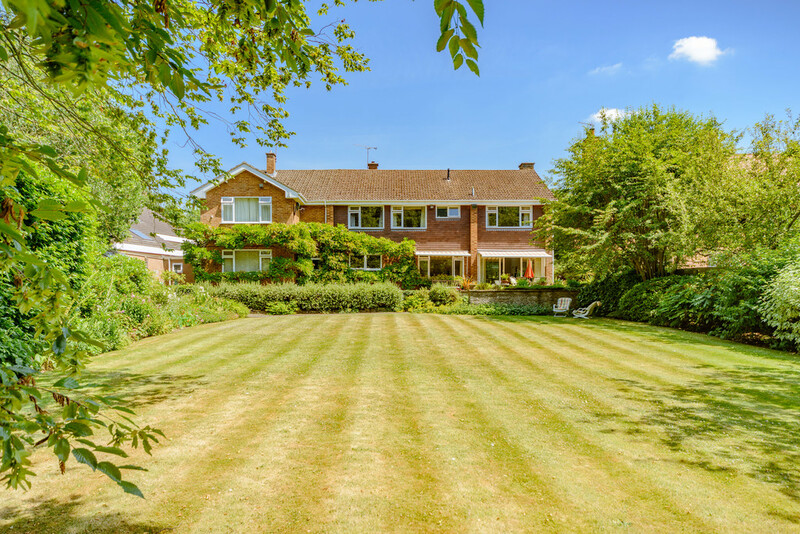 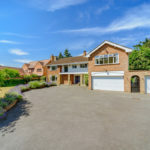 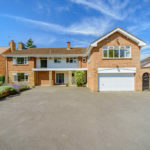 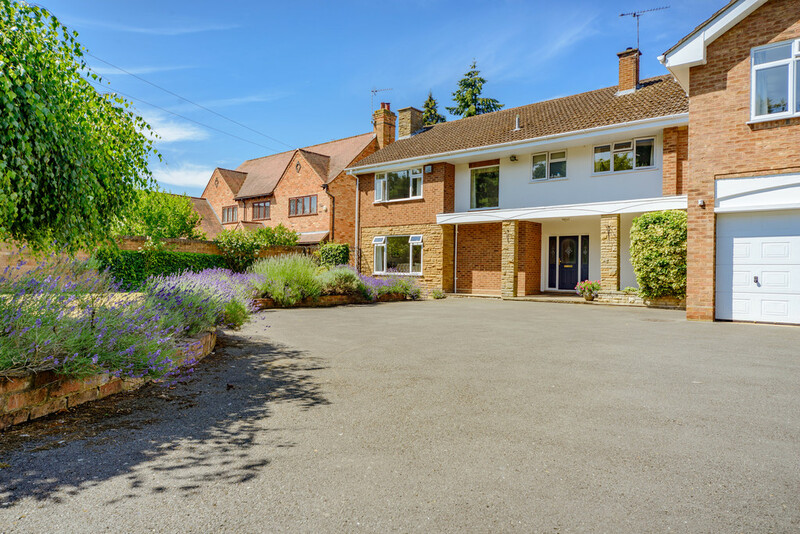 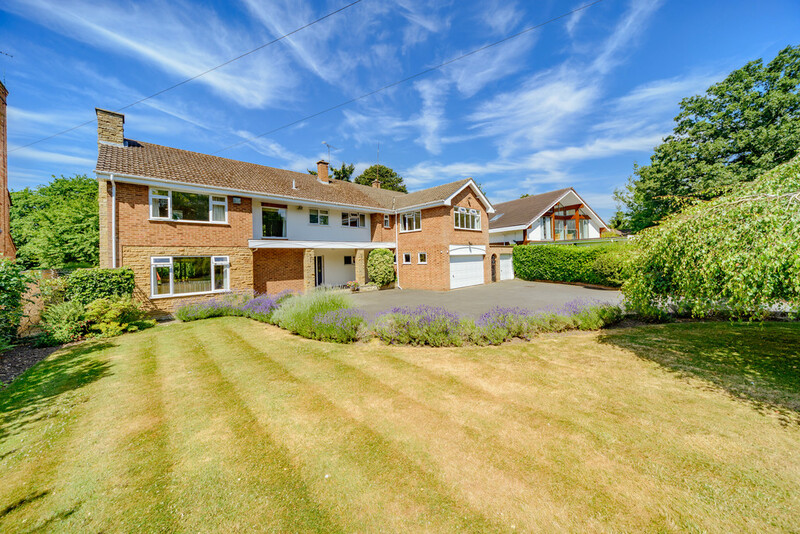 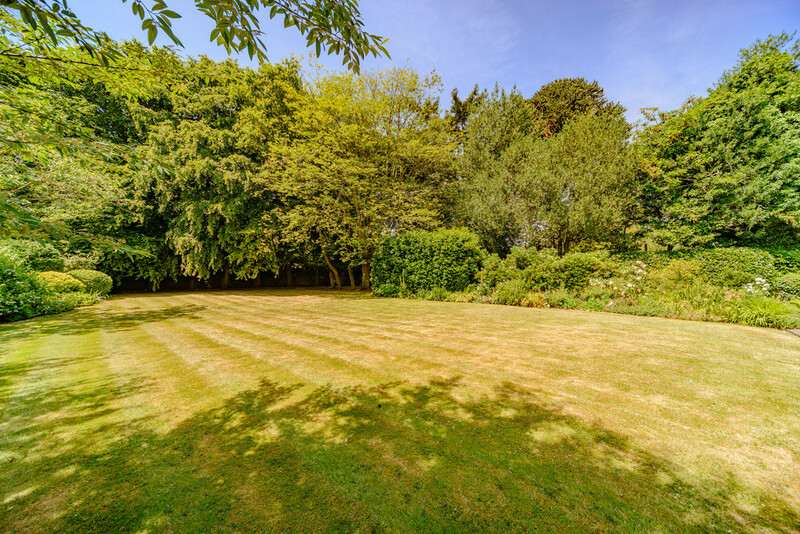 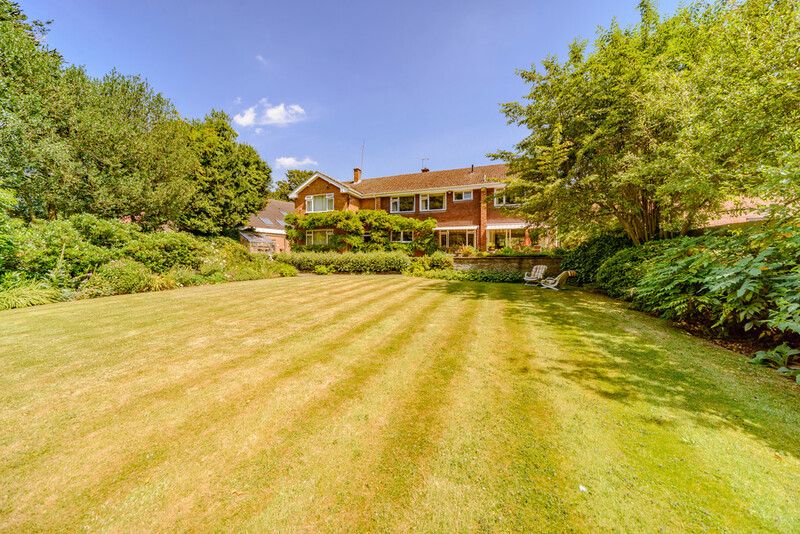 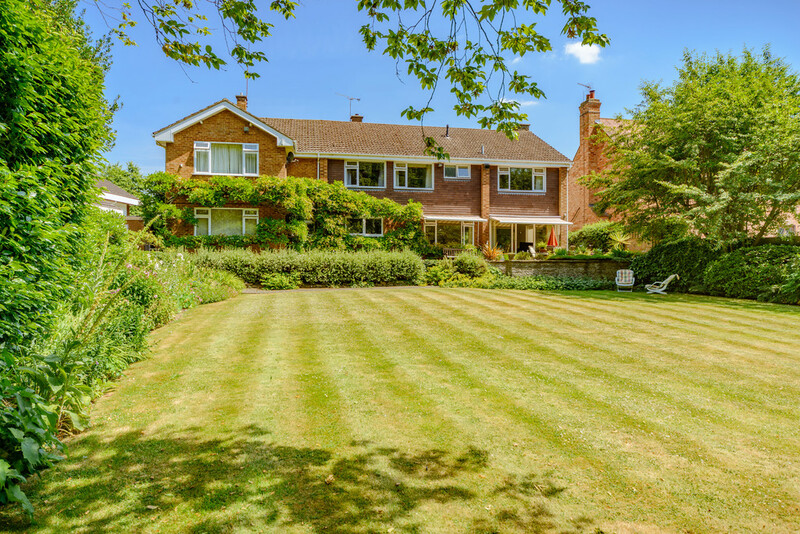 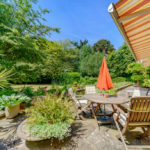 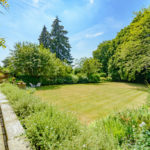 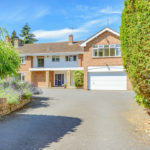 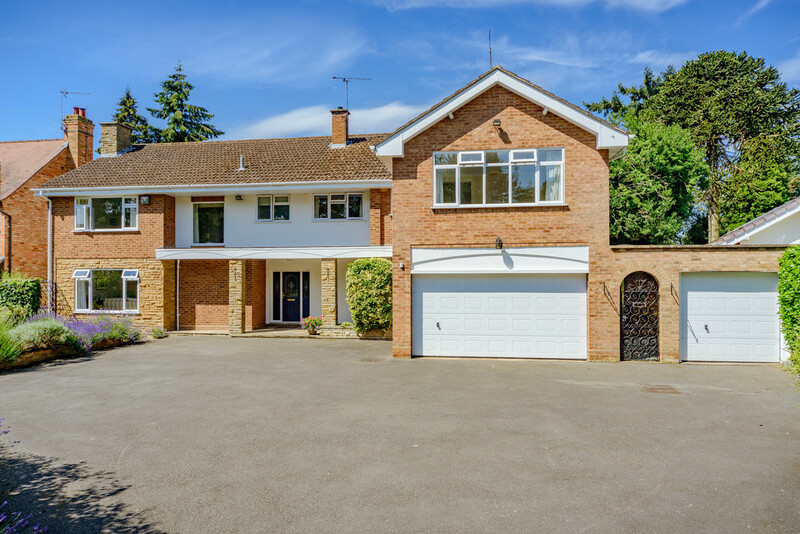 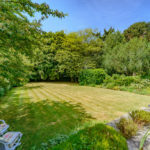 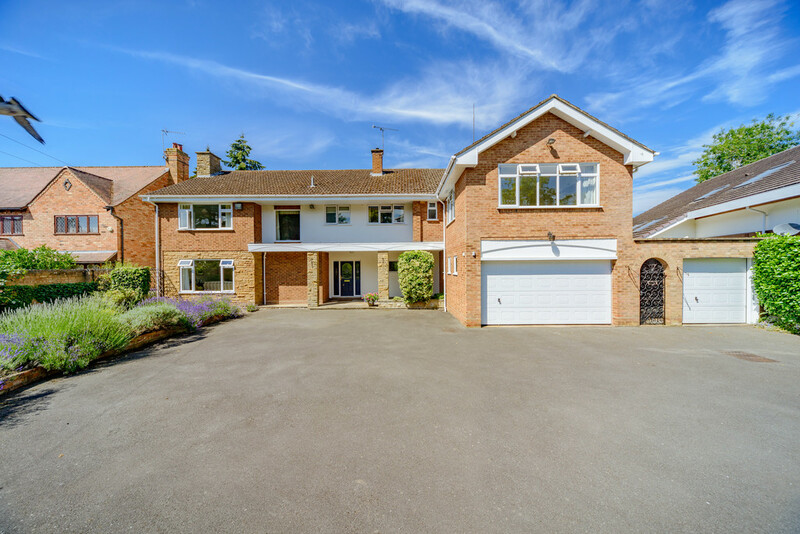 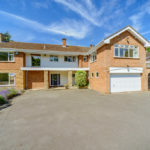 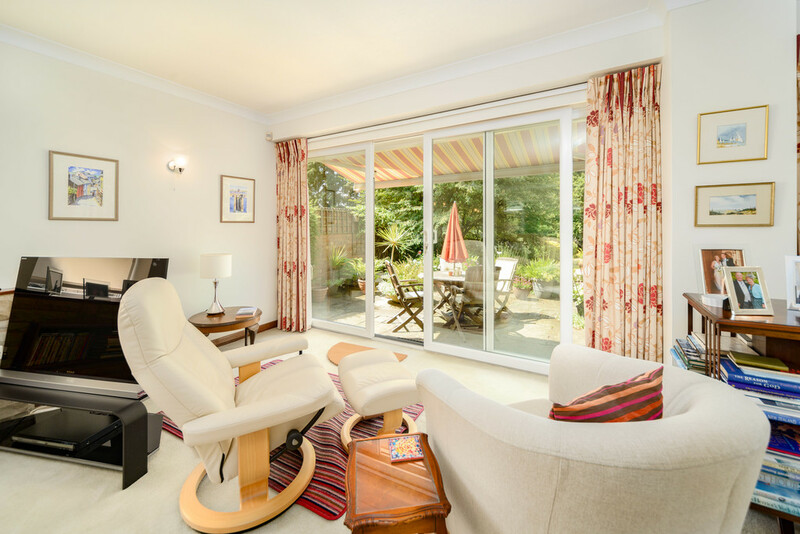 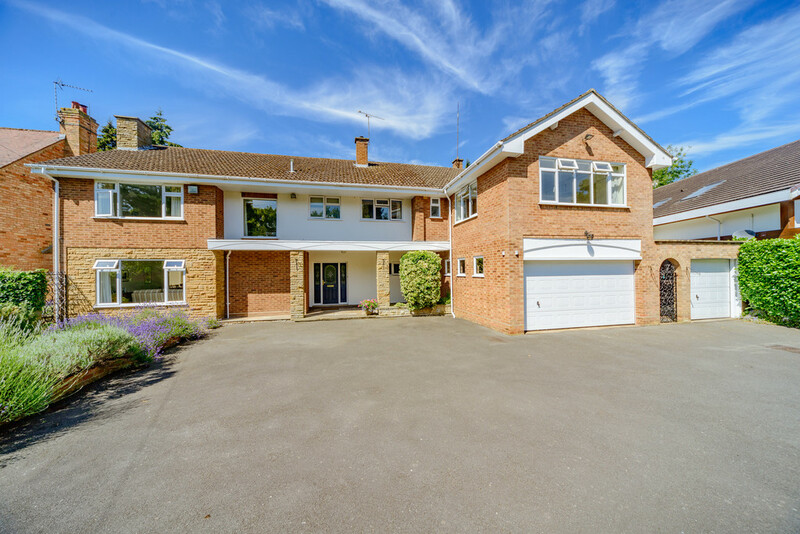 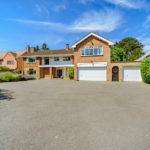 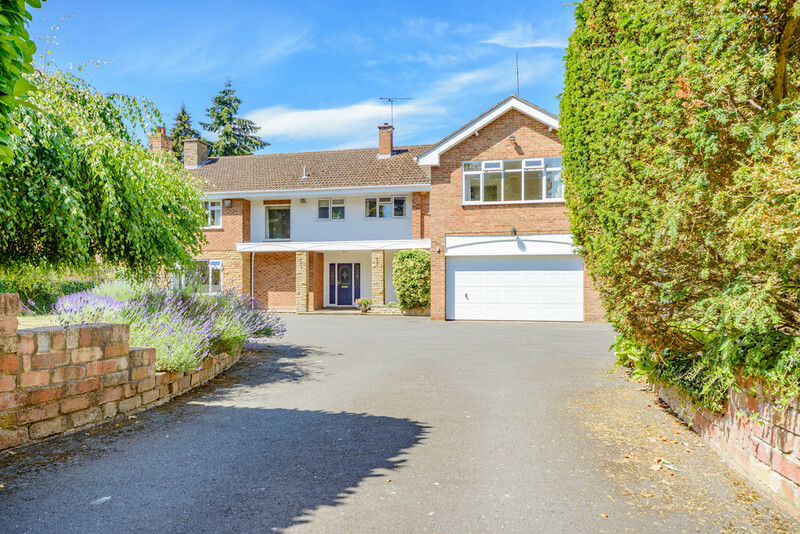 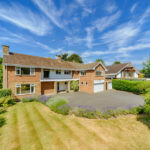 The house is situated on a large south-west rear facing substantial private garden being particularly private and well screened and situated in Kenilworth's most sought after residential road. 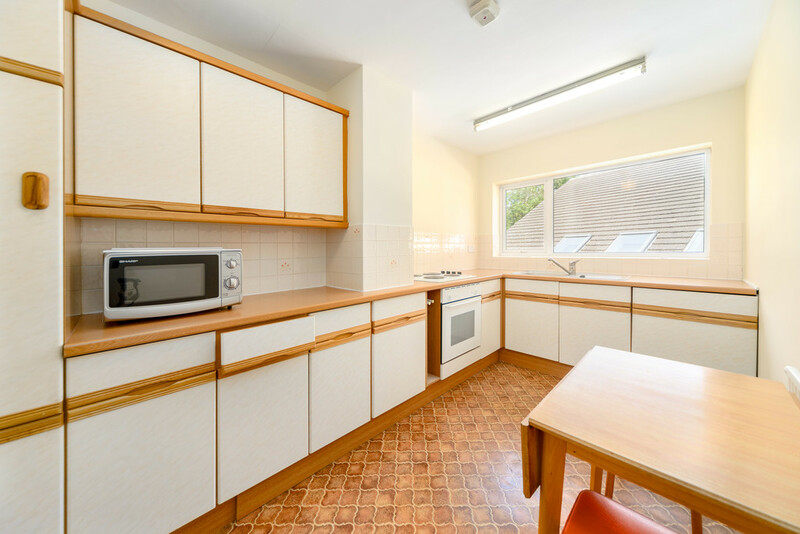 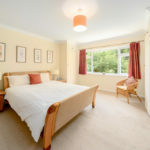 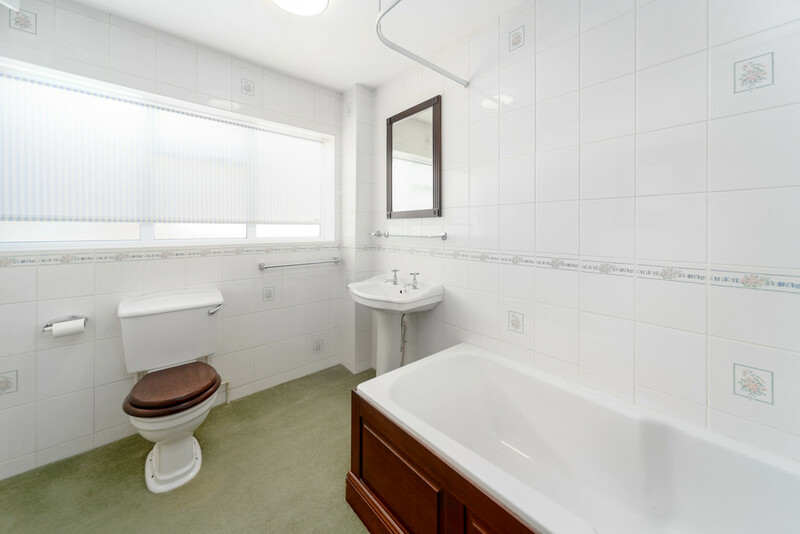 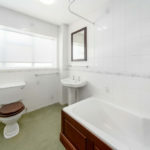 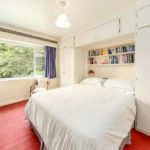 The gas centrally heated double glazed accommodation offers well presented and well maintained accommodation with scope to incorporate the current self-contained apartment into the main accommodation to provide seven bedrooms and four bathrooms three of which could be ensuite. 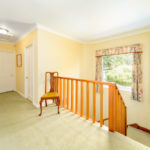 THE HOUSE The substantial main house offers warm air gas centrally heated accommodation with full double glazing, accessed through a large entrance porch, reception hall, cloakroom WC, large L-shaped lounge/dining room in distinct lounge and dining areas, modern breakfast kitchen with integrated appliances, separate family room, utility, rear porch, wine and utility store, double integral garage and side access to the 1st floor self-contained one-bedroom apartment. 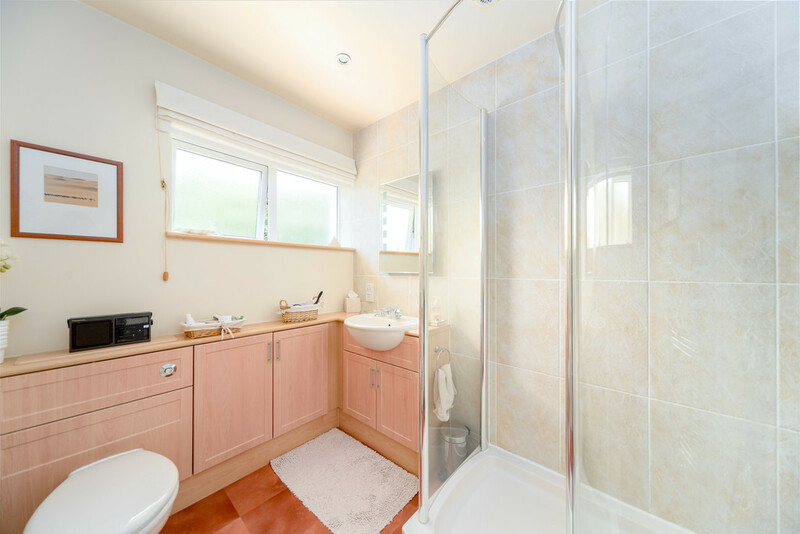 There is a spacious first floor landing, master bedroom with ensuite shower room, four further bedrooms and main family bathroom. 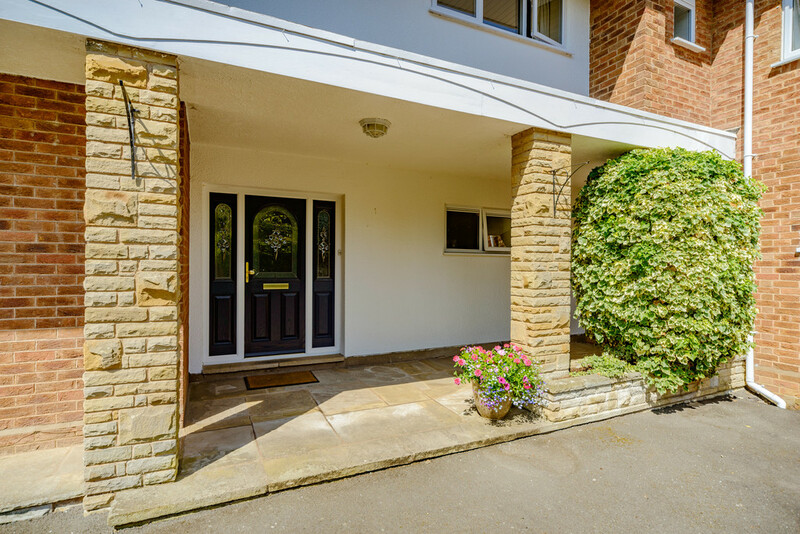 ENTRANCE Large entrance porch with limestone flooring, external lighting, twin stone columns and raised planter, composite panelled and double leaded glazed front door with matching side screens leading into the entrance hall. 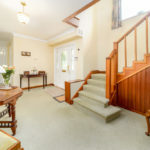 RECEPTION HALL 17' 0" x 10' 4" (5.18m x 3.15m) Staircase with under stairs storage, rising to 1st floor with the feature front landing window, coving, hardwood double doors leading to lounge and a further inner hall with built-in cloaks cupboard with hanging rail and storage cupboards above. 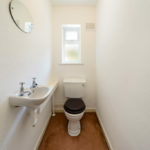 CLOAKROOM 9' 10" x 5' 0" (3m x 1.52m) White refitted modern fittings with low level WC, large vanity wash hand basin with tiled splash backs and twin cupboards beneath, tiled flooring and recessed Johnson and Starley gas fired warm air central heating unit. 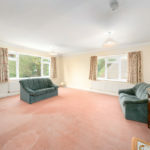 LOUNGE/DINING ROOM 28' 2" x 26' 10" (8.59m x 8.18m) Currently a large L-shaped open plan room with windows to front and windows and patio doors to rear, coving to ceilings, and capable of being divided into two separate areas. 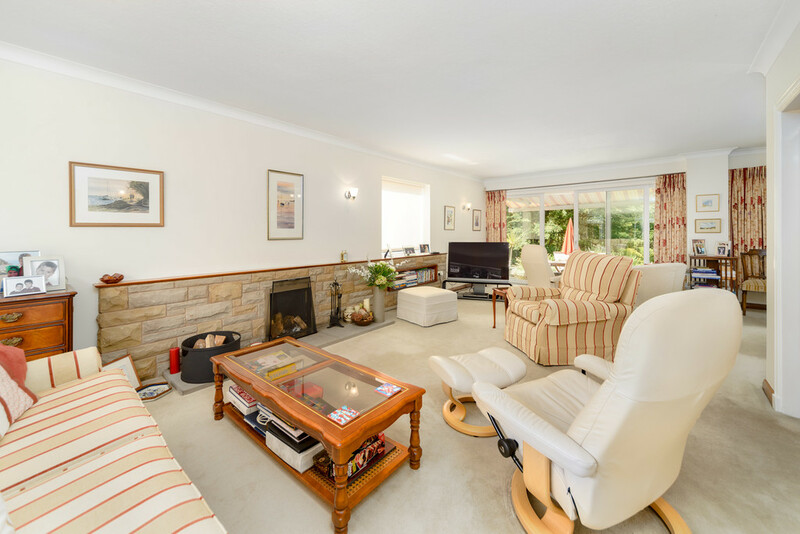 LOUNGE AREA 28 ' 2" x 13' 10" (8.59m x 4.22m) Large stone fireplace feature with under draft grate with hardwood mantel and stone hearth and matching hardwood recess, wall lights, large picture window to front elevation and to side and double glazed patio doors to the rear patio, leading to garden beyond with retractable sun awning above. 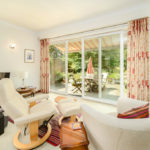 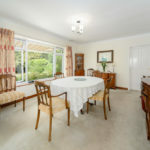 DINING AREA 14' 6" x 12' 0" (4.42m x 3.66m) Picture window overlooking the rear garden with a retractable sun awning above and door to breakfast kitchen. 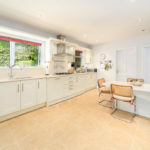 DINING KITCHEN 17' 9" x 11' 10" (5.41m x 3.61m) Amtico tiled flooring, quality fitted with high gloss base and wall units with brushed steel handles, tiled splash backs, light quartz work surfaces with integrated one and a half bowl stainless steel sink unit with mixer tap and matching composite drainer, integrated Bosch appliances including combination microwave oven above a further single electric fan oven and grill brushed steel five burner gas hob with illuminated brushed steel and glass extraction canopy above with recess lighting, integrated refrigerator and freezer and integrated dishwasher. 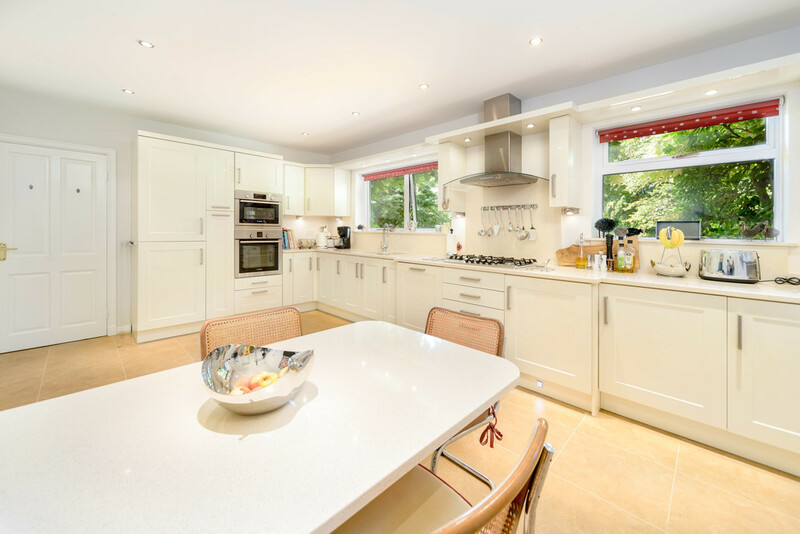 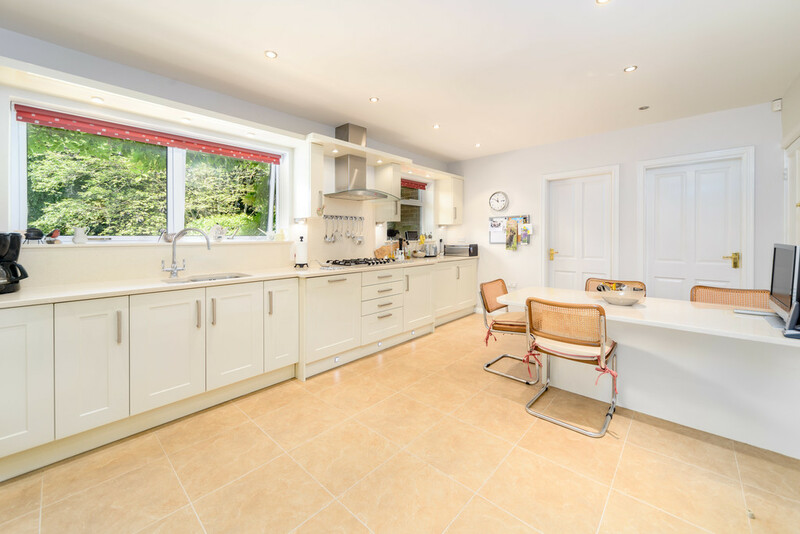 There is an extensive range of kitchen units including wall and base cupboards, fitted drawers and pan drawers, open shelving, spice cupboards, recessed pelmet lighting, further recessed down lighting and a further matching light quartz breakfast table with surrounding seating space. 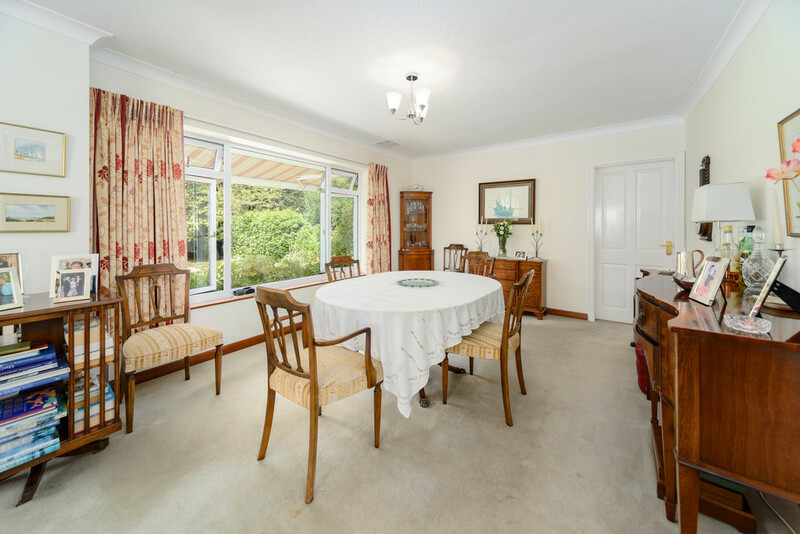 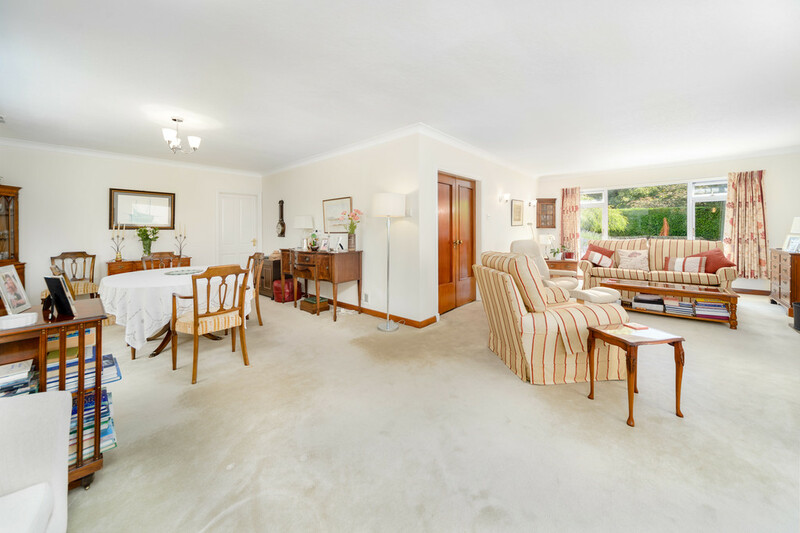 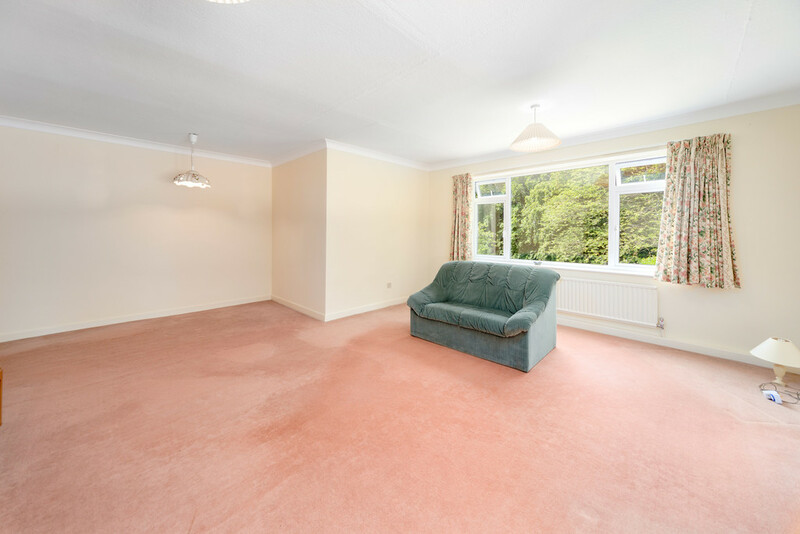 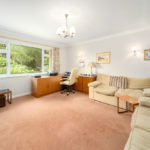 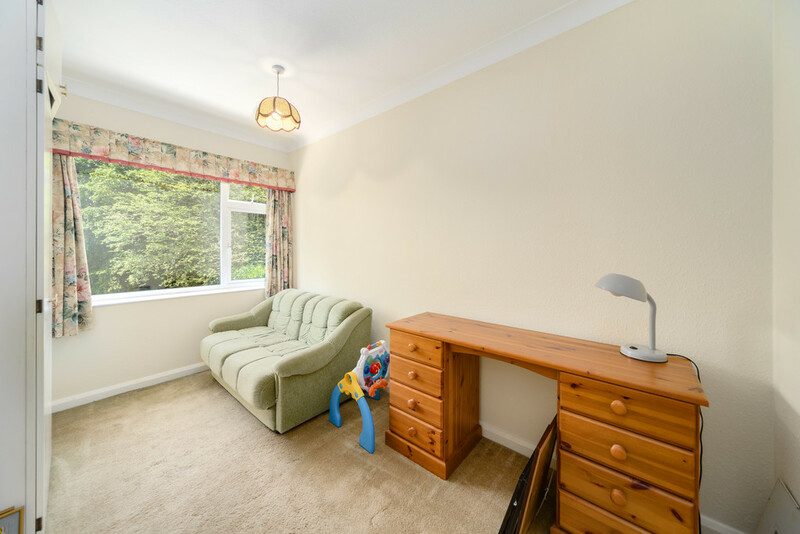 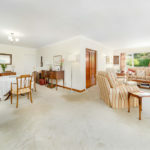 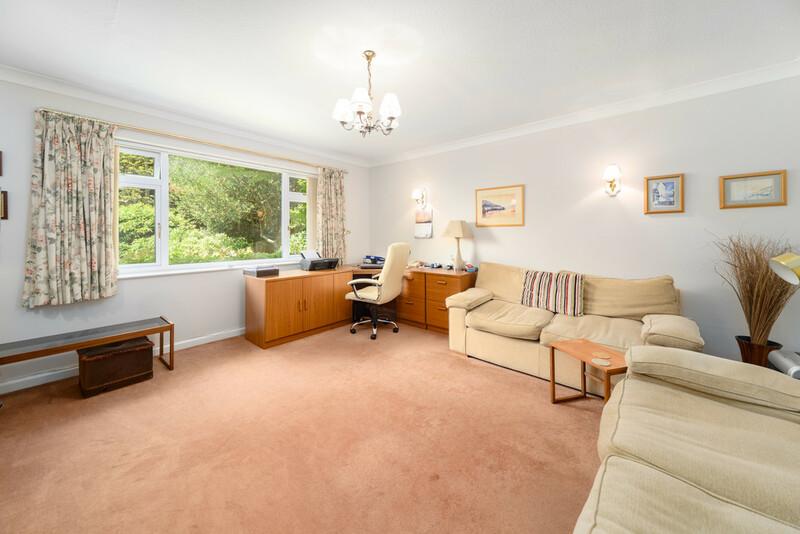 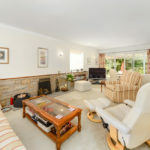 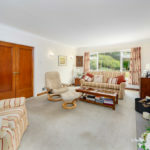 FAMILY ROOM 15' 0" x 13' 8" (4.57m x 4.17m) A delightful room leading off the dining kitchen and having a good view of the rear garden, four wall light points, coving and TV aerial point. 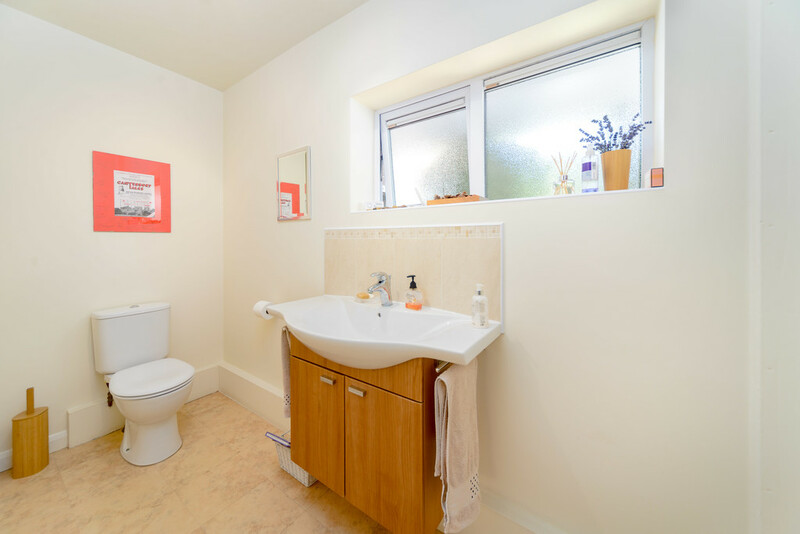 LAUNDRY ROOM 5' 4" x 5' 8" (1.63m x 1.73m) Matching Amtico tiled flooring to kitchen, matching high-gloss units with base units with space and plumbing for automatic washing machine, work surface over with inset single bowl single drainer stainless steel sink unit, tall shelves storage cupboard with further cupboard above, radiator. 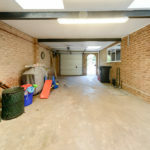 REAR PORCH 18' 4" x 6' 9" (5.59m x 2.06m) Quarry tiled floor, door leading to integral double garage, double door shelved storage cupboards with further storage cupboards above, double glazed door with matching side screens leading to the side carport entrance and staircase leading to the first floor self-contained apartment. 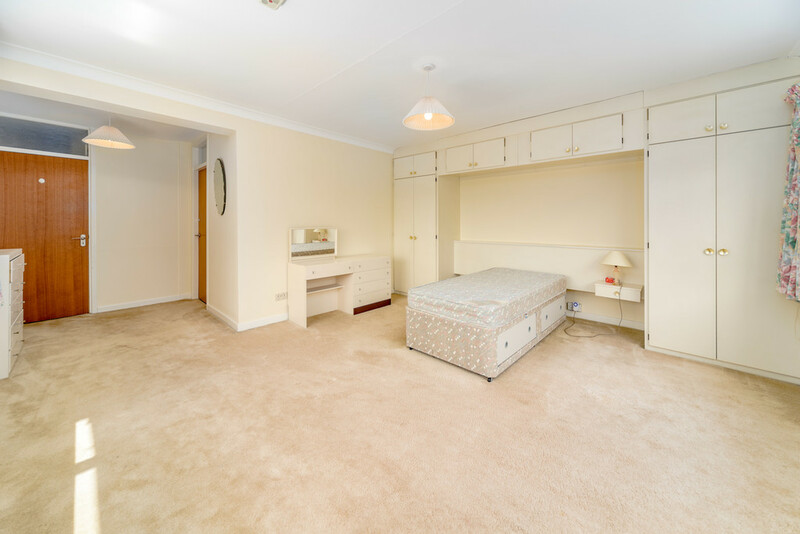 STORE 6' 2" x 2' 8" (1.88m x 0.81m) With fitted light. 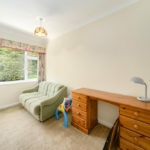 FIRST FLOOR MAIN LANDING Large picture window to front, double door built-in airing cupboard with Vaillant gas fired boiler supplying domestic hot water with fitted time control clock, insulated hot water cylinder and extensive slatted shelving. 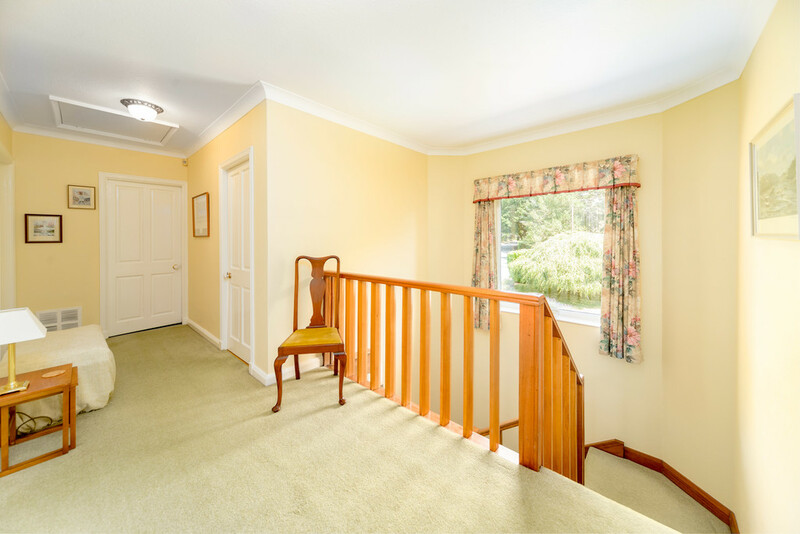 There is access to the boarded roof space with folding access trap with retractable ladder. 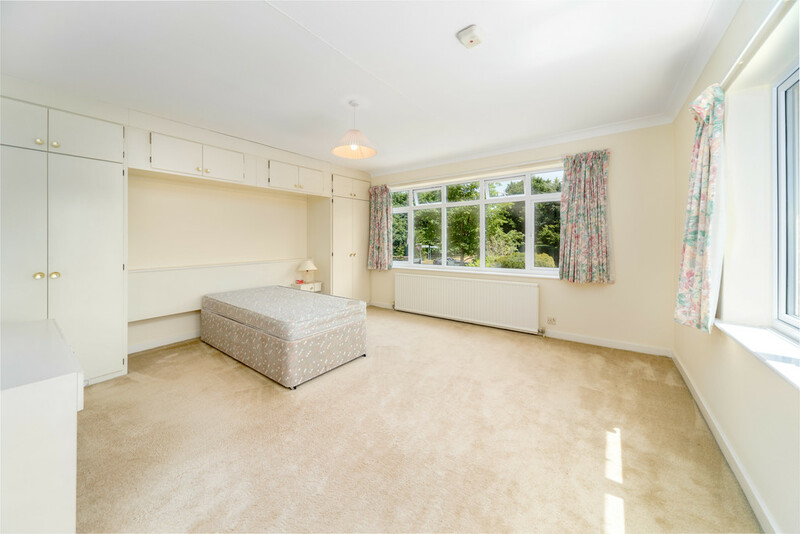 MASTER BEDROOM 15' 0" x 12' 10" (4.57m x 3.91m) Large picture window overlooking the rear garden, extensive range of built-in wardrobe cupboards and storage cupboards, door to ensuite shower room. 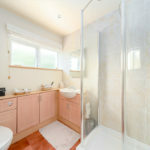 ENSUITE SHOWER ROOM Comprehensively fitted with a large shower cubicle with glazed screens and drying area, Aqualisa mains fed shower, recessed wash hand basin and low-level WC within bathroom units with matching shelf units and windowsill, ceramic tiled walls, tiled flooring, towel warmer/radiator, ceiling down lights and extractor fan. 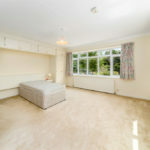 BEDROOM TWO 13' 0" x 13' 0" (3.96m x 3.96m) Large window to front, coving. 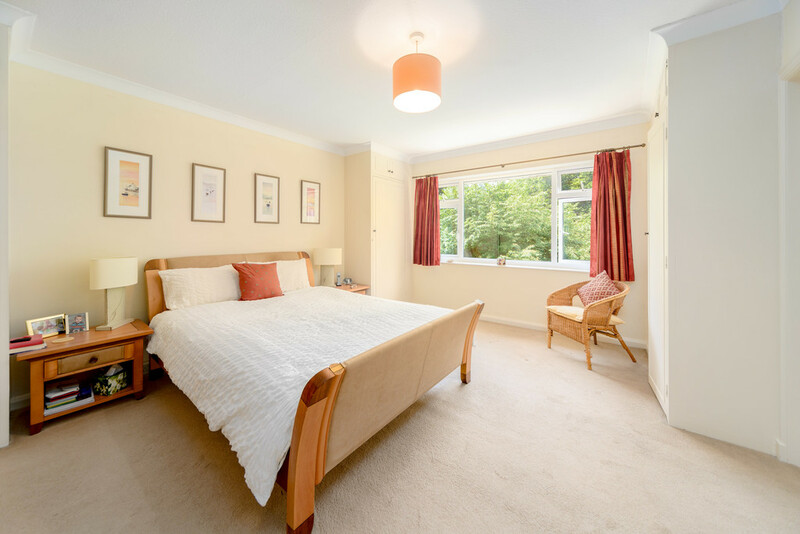 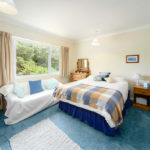 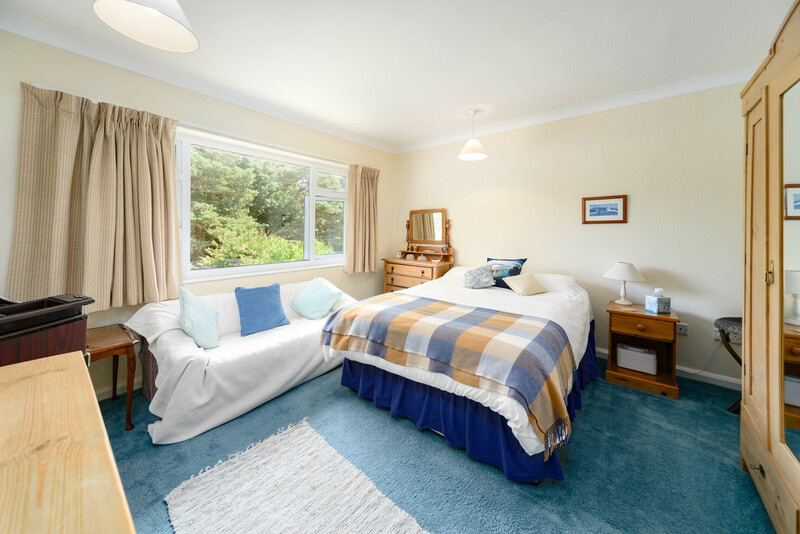 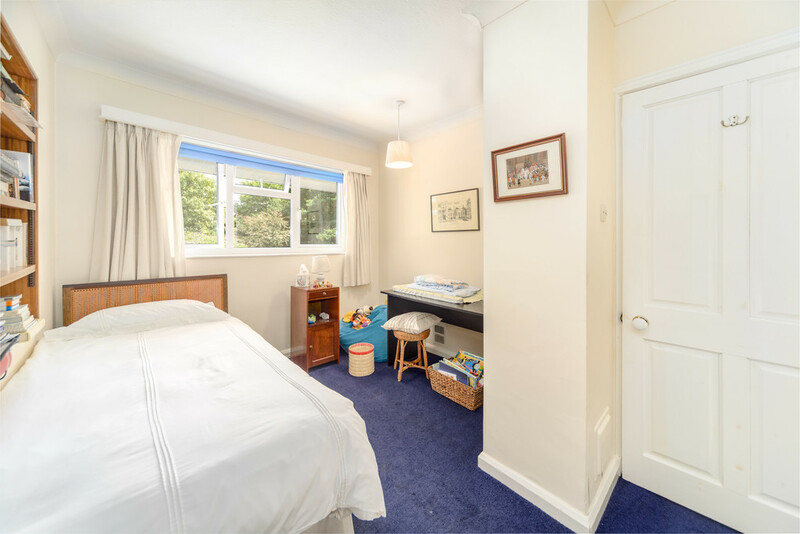 BEDROOM THREE 11' 0" x 12' 0" (3.35m x 3.66m) Two double door fitted wardrobe cupboards with central double bed space with bridging cupboards over recessed adjustable shelving, large picture window overlooking the delightful rear garden, built-in shelved cupboard. 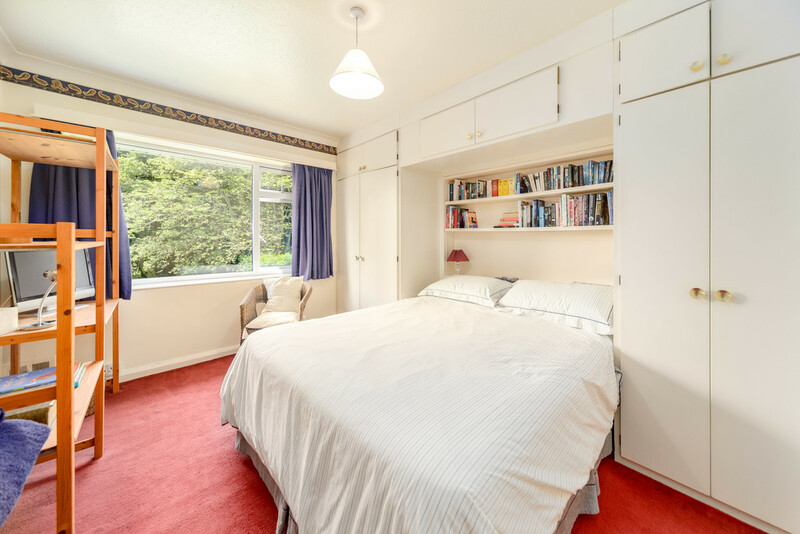 BEDROOM FOUR 12' 1" x 9' 0" (3.68m x 2.74m) Large picture window to front, two mirror fronted sliding door wardrobe cupboard, recessed adjustable shelving. 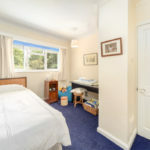 BEDROOM FIVE 12' 0" x 8' 0" (3.66m x 2.44m) Large window overlooking the rear garden, fitted double door wardrobe cupboard with adjoining fitted double door shelved cupboard with storage above. 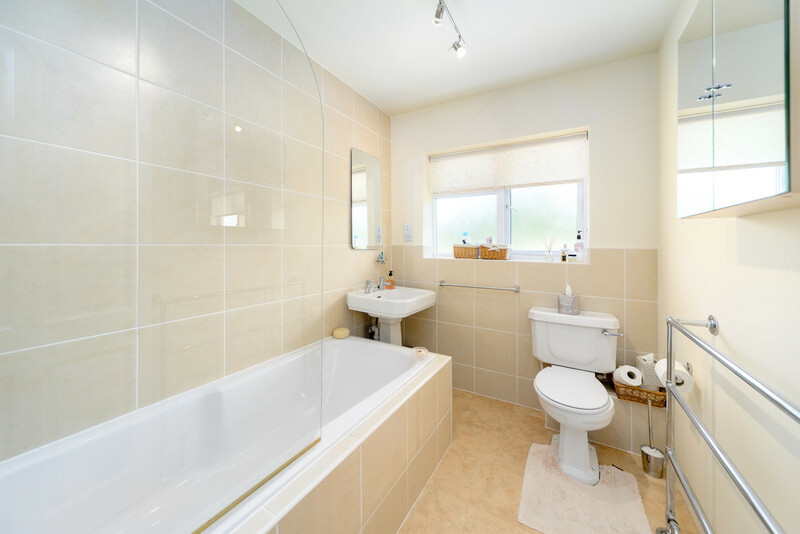 FAMILY BATHROOM 7' 10" x 6' 5" (2.39m x 1.96m) Quality fitted with white sanitary ware and ceramic tiling to full height and half height surrounding the inset bath with Aqualisa mains fed shower above with glazed shower screen, large pedestal wash hand basin, low-level WC, tiled flooring, chrome heated towel warmer radiator, shaver point. 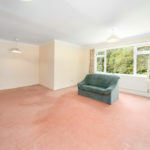 THE FLAT The first floor apartment is self-contained through a side access with staircase leading to 1st floor front door into large entrance hall with cloakroom WC, spacious rear lounge/dining room, fitted kitchen, large double fitted bedroom, en suite bathroom, separate gas-fired combination modern boiler heating with radiators. 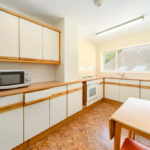 The flat is separately rated for Council tax being band A. 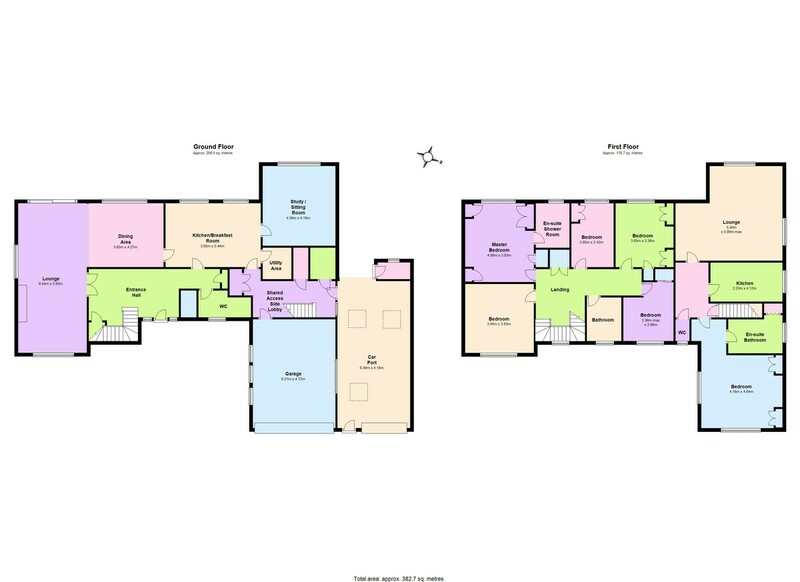 RECEPTION HALL 10' 8" x 5' 9" (3.25m x 1.75m) Radiator, access to roof space, and doors leading off. 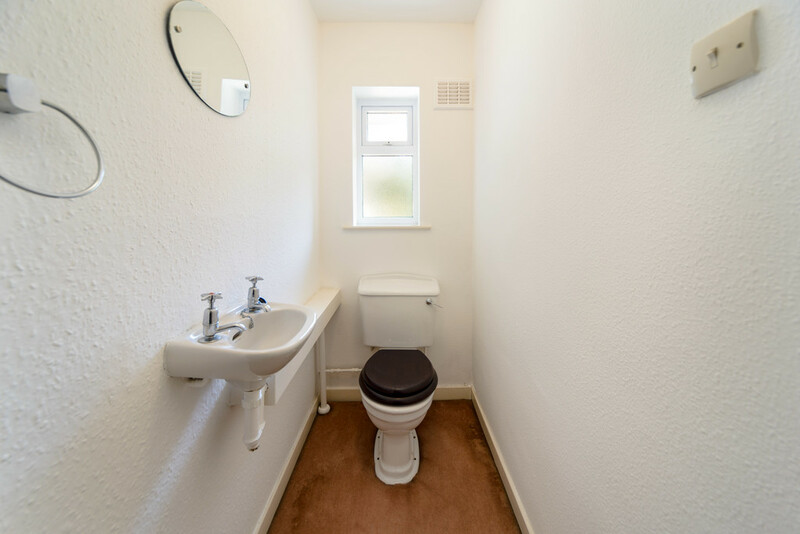 CLOAKROOM 6' 0" x 3' 2" (1.83m x 0.97m) White suite with low level WC and wash basin and window to front. 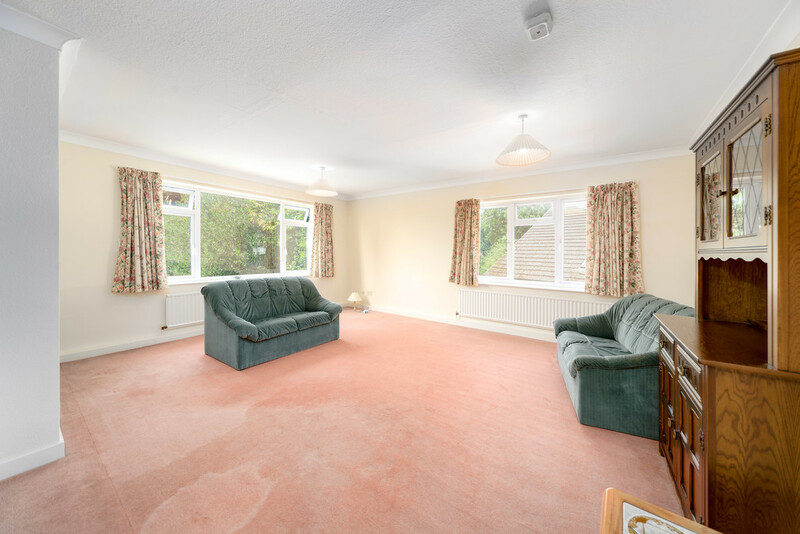 LARGE LIVING ROOM 19' 8" x 18' 0" (5.99m x 5.49m) Windows overlooking the rear garden and side, coving to ceiling and two radiators. 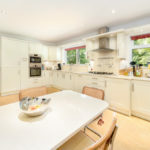 FITTED KITCHEN 13' 6" x 7' 3" (4.11m x 2.21m) Fitted with base and wall units with work surfaces with ceramic tile splash backs, single drainer sink unit with mixer tap, integrated four ring electric hob with single electric fan oven and grill beneath, integrated refrigerator with icebox, vinyl flooring, radiator, large window to side and multi-paned glazed door to hall. 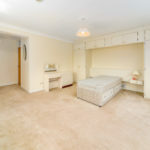 DOUBLE BEDROOM SUITE 20' 5max" x 15' 4" (6.22m x 4.67m) A large spacious and light filled room with windows to the front and side fitted furniture comprising two double door wardrobe cupboards with bridging cupboards over a large double bed space with fitted headboard and bedside cabinet, coving to ceiling, radiator and door to ensuite. 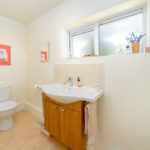 ENSUITE BATHROOM 9' 6" x 6' 2" (2.9m x 1.88m) Fitted with a white suite with large panelled bath with Aqualisa mains fed shower over, with shower rail and curtain, pedestal wash hand basin, low-level WC, ceramic tiling to full and half height, chromium heated towel rail, double door cupboard housing the Intergas combination condensing gas fired central heating boiler installed in December 2017 for heating and hot water for the apartment. 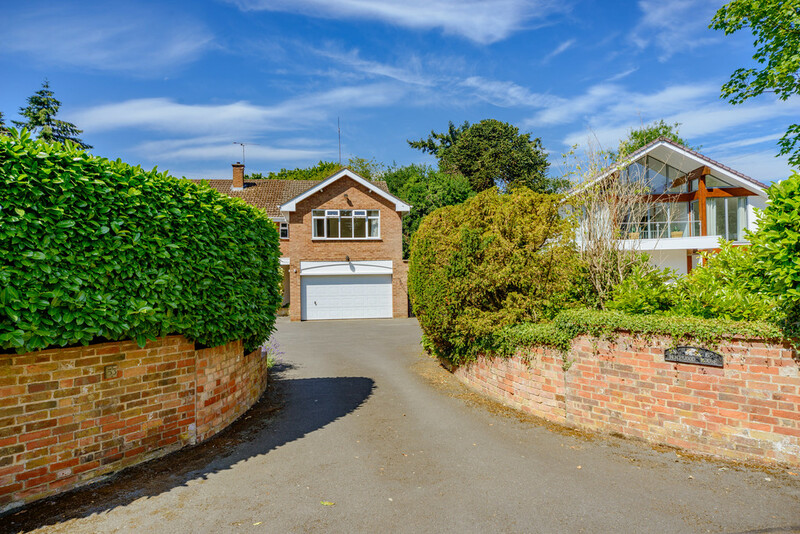 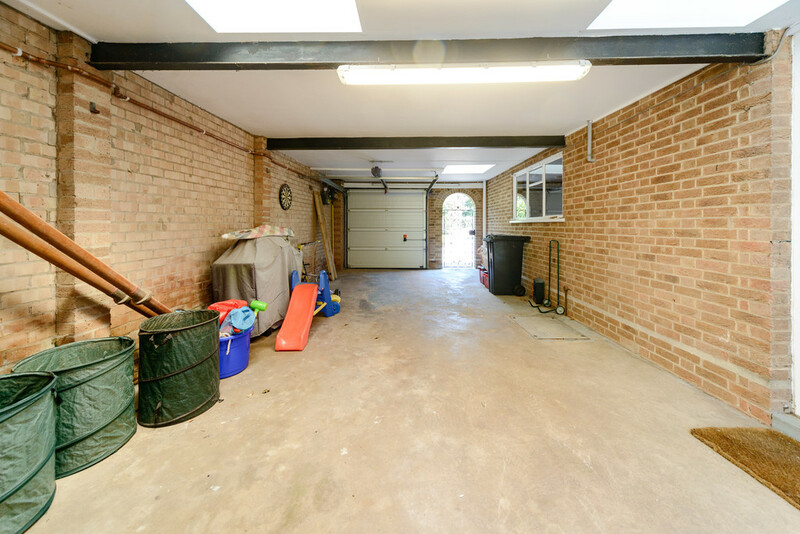 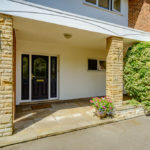 OUTSIDE FRONT The property is set behind brick walls with shaped walling surrounding the driveway entrance to a large front forecourt with direct vehicular access to the garage and to the sidecar port. 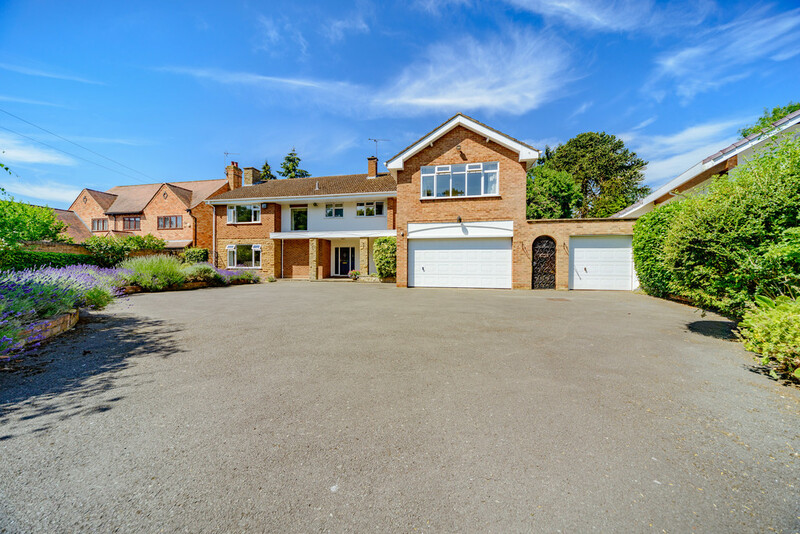 There is ample car parking space at the front of the property for numerous cars. 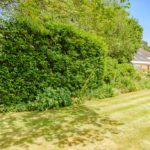 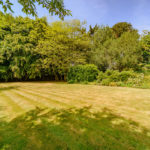 The side of the drive is a shaped shrubbery garden with retaining brick wall, shrubbery boundary and attractive planting. 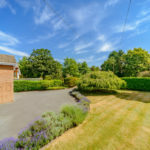 A large lawn with inset weeping birch, has surrounding retaining brick walls with inset lavender and enclosed by brick side walls with wrought iron trellis and gated access with pathways to the side. 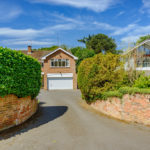 INTEGRAL DOUBLE GARAGE 20' 5" x 15' 5" (6.22m x 4.7m) Power and light connected, personal door linking to the rear porch, and insulated up and over electrically operated and remote-controlled front door. 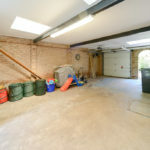 LARGE CAR PORTS 26' 10" x 13' 10" (8.18m x 4.22m) Front electrically operated and remote controlled insulated up and over door, wrought iron personal gate within arched brickwork entrance, rear brick built garden store and fibreglass roof light. 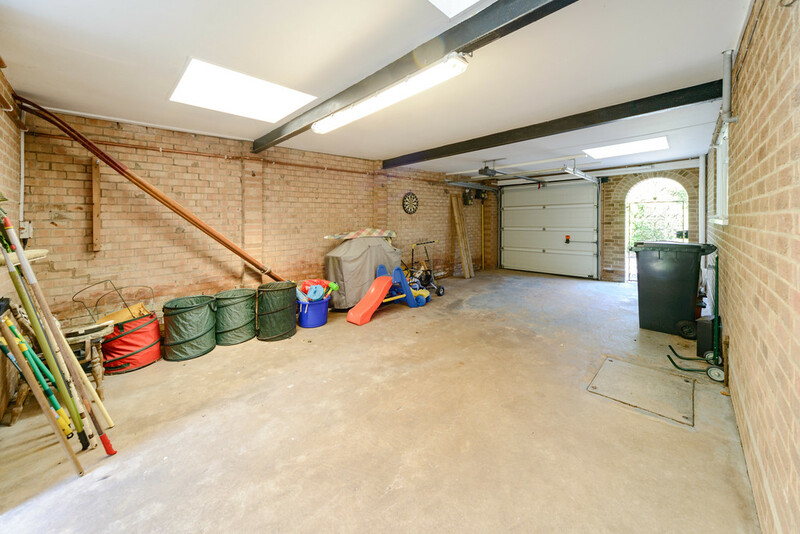 The carport is open to rear and leads to a side paved area with aluminium and glazed greenhouse and an outside cold water tap. 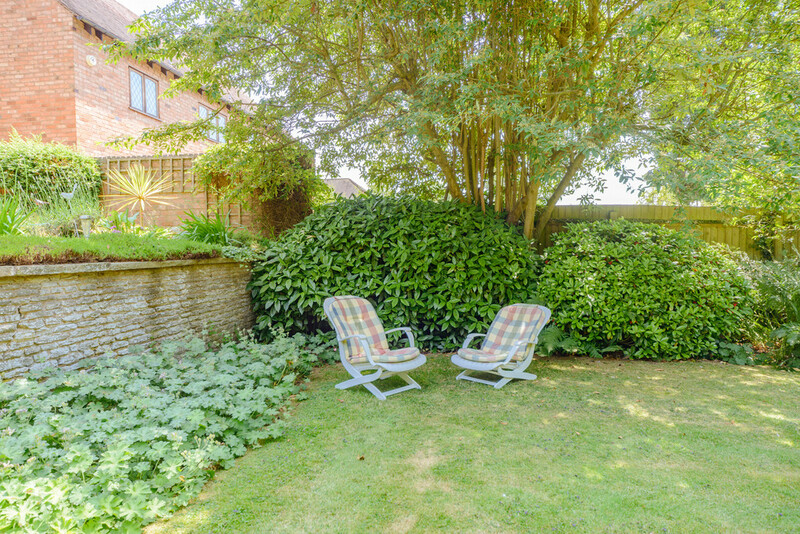 REAR GARDEN The rear garden is a delightful feature of the property having considerable privacy and seclusion with a south-westerly aspect with raised stone paved patio and seating area, steps to the main lawn with side shrubbery borders and mature planting. 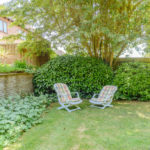 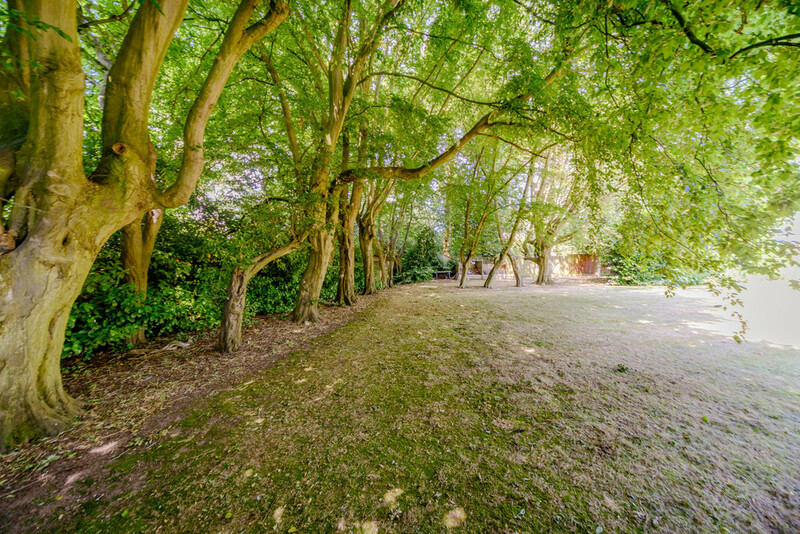 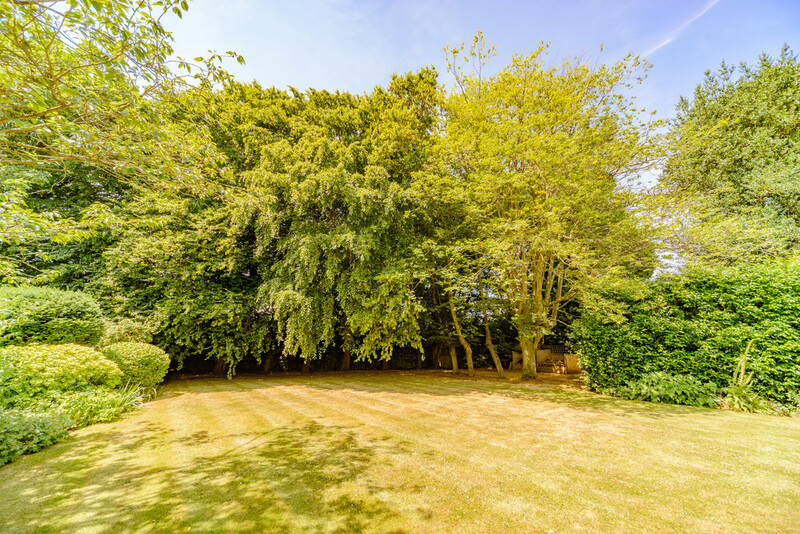 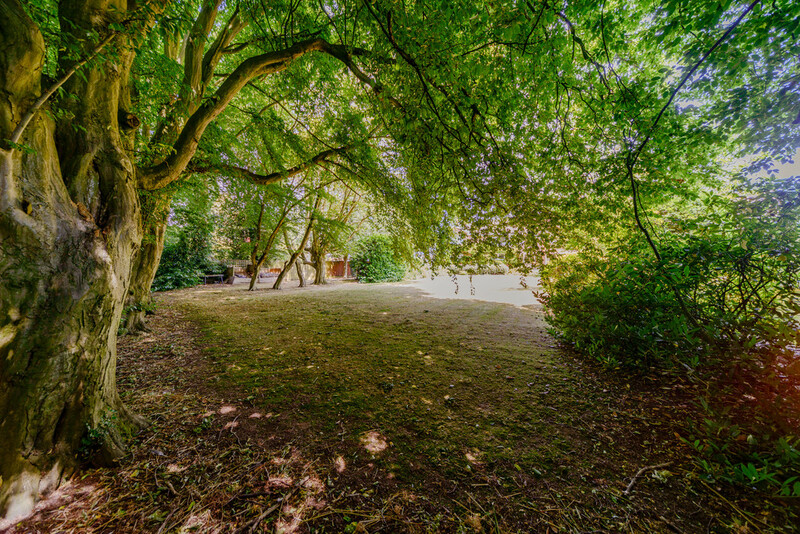 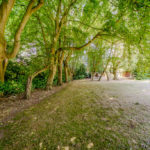 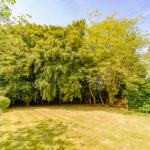 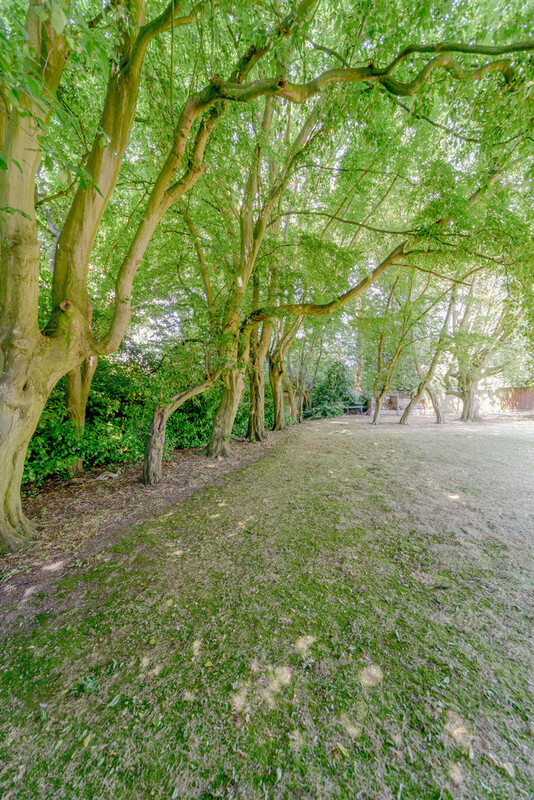 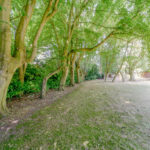 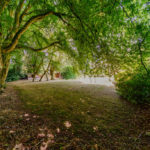 To the rear of the garden are mature beech trees providing a delightful screen and tranquil setting to the garden together with shelter. 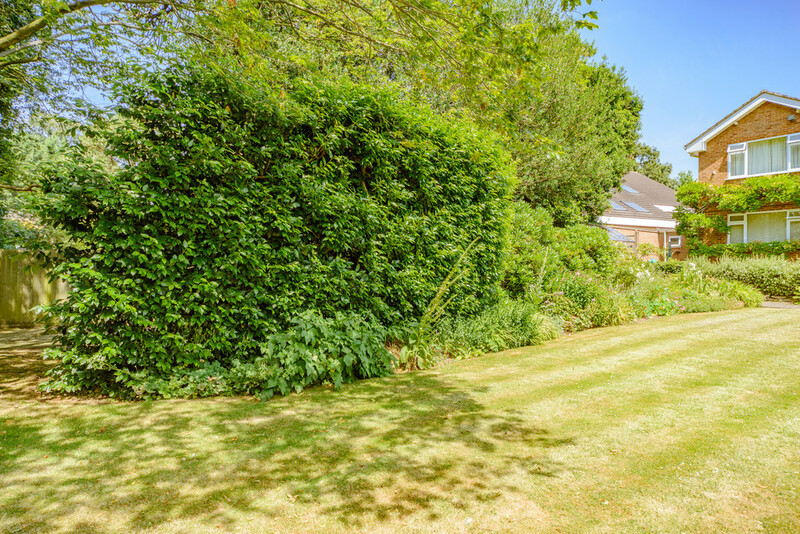 To the northern side of the garden is a further paved path leading through shrubbery beds with rhododendrons. 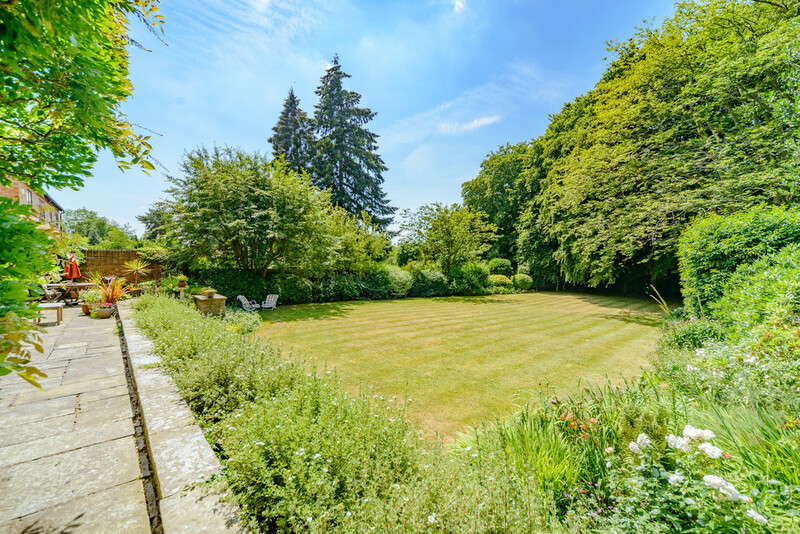 To the rear of the house at ground floor level is a substantial feature mature wisteria.The garden is fully enclosed to all boundaries. 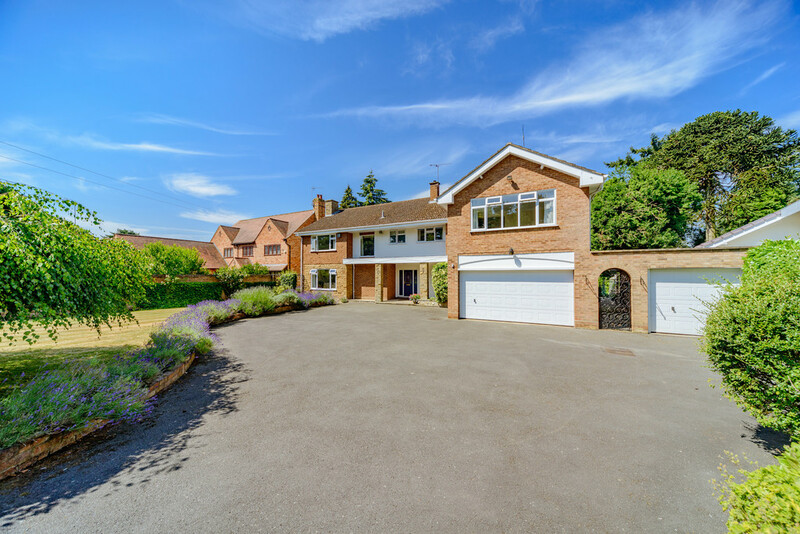 A substantial, prestige, detached family home with five bedrooms, ensuite, family bathroom, three reception rooms, breakfast kitchen and a separate one bedroom one reception room self-contained apartment. 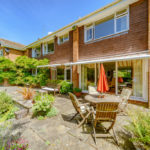 Situated in a delightful west facing landscaped garden with double garage and carport and ample parking.